It looks like Kang the Conqueror is up to no good again. He has set his sights to dominate Earth once more via an intergalactic battle royale known only as the Contest. Its host, the enigmatic Collector, has gone and captured the planet's greatest super-powered warriors. Enslaved to the will of the summoners, they have no choice but to fight each other until the Contest reaches its grim end. As the Summoner, you must compete against Kang for Earth's future. He has assembled a vast array of champions to win, so you must be prepared to do the same. Gather your favorite heroes and villains from the Marvel Universe, turn them into the most powerful fighting force imaginable, and put their skills to the test in the heat of battle. Do whatever it takes to win; the powers of the X-Men, Avengers, Brotherhood of Mutants, Guardians of the Galaxy and more are all at your disposal. Do you have what it takes to save the world, or are you ready to usher in the Age of Kang? Enter the Contest and find out! In Marvel: Contest of Champions, you'll watch the greatest heroes and villains in the Marvel Universe duke it out in the biggest battle royale the galaxy has ever seen! Birth mutants and self-made heroes are all at your command. You only need to reach into your touchscreen to get them. Select from an extensive roster of over 50 characters. Play as Wolverine, Iron Man, Star-Lord, Captain Marvel, Storm, the Incredible Hulk, Spiderman, Ultron and more! Train your heroes. Gather rare ISO-8 to power them up and improve their abilities. As bloody and brutal as the Contest may be, it is the only thing standing between Earth's freedom and Kang's rule. When your champions are ready to fight, hold nothing back! Go on the offense and beat your opponent down with a never-ending flurry of attacks. Be defensive! Dodge and block your enemies' fiercest maneuvers. Unleash a devastating special attack and bring your foes to their knees. Bring the right champion for the job. Some supers work better against others. If you enjoy both the classic arcade brawler and the extensive universe of Marvel Comics, then you owe it to yourself to see what all the excitement is about with Marvel: Contest of Champions. 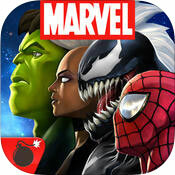 This game has it all: fantastic graphics, brutal beat-downs, and all your favorite superheroes and villains in one app. On top of that, you can experience it all for free. Seriously, stop browsing the app reviews and get Contest of Champions now! The question that has long dominated geek culture has always been: Will this war ever end? What war is this referring to exactly? The war between Marvel and DC of course! It seems that whenever one company does something to entertain people, the other tries to one-up it with something similar. For example, DC made a killing with the Dark Knight film trilogy, so Marvel countered with the Marvel Cinematic Universe. Even the game industry is not exempt, as fans of the Marvel vs. Capcom crossover series will remember Mortal Kombat vs. DC Universe. 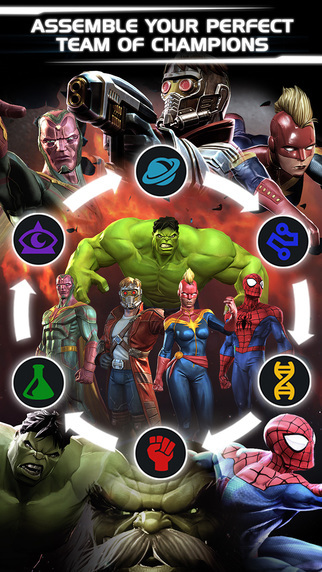 When DC made a mobile version of Injustice: Gods Among Us, it was only natural that Marvel would launch a counterattack, which they have with Contest of Champions. The good news is that the competition between the two comic giants has often yielded great products. People enjoyed Injustice, which a quick glance at the game reviews will show you, and the same can thankfully be said for Contest of Champions as well. It has its foibles with some slightly annoying freemium features and other things, but overall, it's a very fun mobile brawler that just about any Marvel fan can enjoy. At its heart, Contest of Champions is a fighting game. Taking control of one of the Marvel Universe's many heroes or villains, you have to beat the snot out of another such character. While the mobile format sadly doesn't give the game much room to be as deep as the console and arcade brawlers of old, it still does its job. The touchscreen controls are intuitive and responsive enough to help you keep up with the action, which can get quite intense at times. You have three attacks that are arranged in terms of speed and power, with the fastest being weak but easy to combo with, and the slowest being cumbersome but devastating and capable of guard-breaking. You also have some defensive maneuvers that allow you to block or dash out of the way of oncoming attacks. Finally, you have a special move that will really introduce your opponent to a new world of pain. It may not sound like much, but it works. While there may be no combo attacks or flashy finishing moves to memorize, Contest of Champions still requires very skillful play. Knowing when to attack, when to dodge, when to back off, and when to use your special attack are absolutely vital to winning. Simply screen-mashing might work when you're up against an equal or inferior opponent, but when you're fighting someone who clearly outmatches you, then you need to learn to fight more carefully. It's hard to take down an enemy who's beyond your level, but it's possible, and you'll feel awesome every time you pull it off. However, even weaker foes demand skillful play since your characters don't heal damage between fights when they're in the middle of a quest. The end result is a surprisingly fun game that's easy to learn, but makes absolutely sure you don't slack off. It helps that Contest of Champions is very good-looking. Every single character is rendered in outstanding detail. They hold up amazingly well up close and are still recognizable from a distance; you won't be mistaking Iron Man for Cyclops, the Hulk or Thor anytime soon. It's even better that everyone is depicted to scale too. Big characters like Juggernaut look gigantic compared to more regularly-sized folk like Spiderman, which makes fighting them look very cool. The animation is really good too. While the punches and kicks don't always feel like they deliver the kind of impact they should, it's still a joy to see these characters beat the tar out of one another. It's especially a treat to see what kind of brutality a special attack will deliver, though those can get repetitive if you find yourself using the same characters often enough. Unfortunately, not everything is peachy with the combat. While the app boasts an impressive roster of characters from a wide variety of Marvel-owned franchises, there just isn't a lot of variety for them. Despite their different appearances and powers, they all basically fight using the same actions. Don't expect to do anything fancy with Wolverine's claws, Spidey's webs, Stark's arsenal, or Storm's control over the weather that isn't purely cosmetic. The most that we see are some relatively passive abilities that kick off in special circumstances. For example, Black Panther can make enemies bleed, while Iron Man's armor can get a temporary boost in combat. Those are nice, but they're not enough to make a difference. Things get even worse when you go outside combat. For one, you have to deal with the rather silly story. The Collector is hosting an inter-dimensional combat tournament not-so-creatively called the Contest, and he's abducted various Marvel heroes and villains to take part in it. However, they're not players in the Contest; they're merely pawns for Kang the Conqueror, who's hoping to use it as a chance to take over the world, and the Summoner, who you play as. It's a very silly concept that reduces the Marvel Universe's colorful cast to a bunch of collectible action figures with no personality. It doesn't help that the plot is carried out with some dull dialogue exchanges between Kang and the Collector, with the former basically just shaking his fist at you and saying: I'll get you yet! Mobile apps and fighting games seldom lend themselves well to storytelling, but Marvel's boys and girls deserve much better than this. The bigger problem is that Contest of Champions utilizes some irritating policies in its quest to make money. For one thing, you can't just buy the characters you want; the process is done in a manner similar to that of a slot machine. Furthermore, there's also an energy meter that's expended as you move around the map of each quest. To be fair, it's not as bad as it is in other games. In fact, you can squeeze a lot of playtime out of Contest of Champions before you need to shut it down and recharge, and it's a game that works best in short bursts of time anyway. However, as generous as it may be, it's still an unwanted limitation hanging over your head that will likely impede your progress eventually. 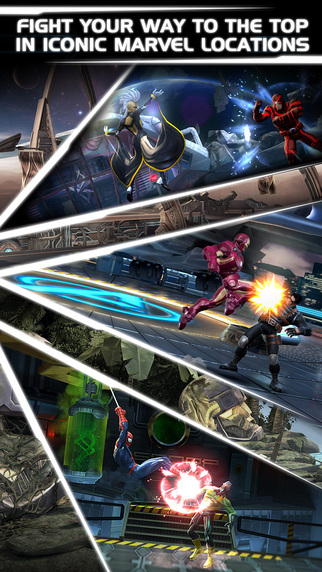 Regardless of its faults, Marvel's Contest of Champions is still a solid app overall. The combat is fast, furious, looks very cool, and rewards skill admirably. The roster is expansive and solid, and it gives you ample opportunity to create a fighting force composed of your favorite comic book characters, provided the dice rolls are in your favor. If you can handle that bit pf randomness and an annoying energy meter, you'll find much to enjoy with Contest of Champions.